Around 12:38 pm EST today, an energetic sunspot region on the Sun released a flare in our direction. The video above, a crop from an SDO AIA 171 mpeg, shows the shifting coronal loops surrounding sunspot 1158 as it rotates into view over the past day or so. The flare can be seen very briefly as a bright flash at the end of the video. 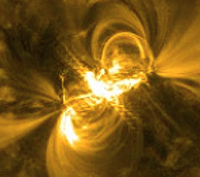 The resulting coronal mass ejection (CME) was classified as an M6.6, which is a stronger medium-sized flare that has the potential to cause radio blackouts on Earth…in fact, the radio emissions were picked up and recorded – click here to listen! The active region is now more than 100,000 km wide with at least a dozen Earth-sized dark cores scattered beneath its unstable magnetic canopy. Sunspots are areas where the Sun’s internal magnetic fields “bubble up” and create cooler areas on the surface. Magnetic lines surround the depression carrying superheated solar plasma within them in arcing loops. Sometimes these loops lose stability and “snap”, releasing solar particles outwards into space at hundreds of thousands of miles per hour. If they are aimed at Earth we experience it as a “solar storm”, which has the potential to disrupt electronics and communications in orbit and on the ground. Only the most powerful solar storms can penetrate our magnetosphere to cause big problems, but they can create ionized particles in our atmosphere around the poles that glow brightly…a.k.a. the aurorae. Read more about this event and other recently active areas on the Sun on spaceweather.com. Video: SDO (NASA) and the AIA consortium. Previous Post Happy Birthday to LITD! Pretty cool! Do we know how strong this was in comparison to the solar storm that created outages in Canada a few years back?